Which Western Digital Caviar drive will suit you best? Find out the answer as we explain the real difference between WD Blue, Black and Green. 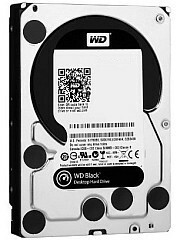 WD Caviar are 3.5" internal hard disk drives made for desktop computers, NAS and servers. Over two decades, they have evolved into several breeds catering to different types of computer users. In the hard drive universe, a WD Caviar Blue is the closest thing to a jack of all trades. Intended for budget and mainstream users, they are designed to deliver solid performance for most tasks... while being friendly to your wallet. Speed: Thanks to its 7,200 RPM spin speed, WD Blue offers solid performance for its price. Boasting 140+ MB/s read speeds and 130+ MB/s write speeds, it is faster than Green by about 25%. In fact, it is as quick as the higher end WD Black when transferring large files. However, its 15 ms access time is slower than Black's 6 ms... making it less responsive when running programs and multi-tasking. Reliability: While Western Digital Caviar Blue's two year warranty is nothing to shout about, it is widely regarded as one of the most durable budget drives. In Amazon alone, it has earned a 4.5 stars rating from over 900 customer reviews. Power Consumption: WD Blue's power draw of 6.8 W is lower than similar drives from other brands (Seagate: 7.5 W, Hitachi: 8 W). While WD Green consume even less power (4.5 W), we have to remember that it is a slower drive. 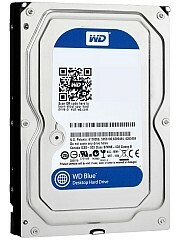 Price: Blue's retail price is the lowest among all Western Digital Caviar hard drives. For the same capacity, it is about 50% cheaper than Black, and 10% cheaper than Green - Click here for the latest WD Blue prices. RECOMMENDATION: WD Caviar Blue is the best choice if you're on a tight budget and intend to run and store everything (operating system, programs, media files) on a single hard drive. Its popular combination of value for money and performance has made WD Blue a long time best seller on Amazon (#1 most sold internal hard drive at the time of writing). If Blue is a humble hard worker, then WD Caviar Black must be the flashy speedster. Built for performance and reliability, it caters to demanding consumers such as gamers, graphics professionals, techies and business users. Speed: As one would expect, Western Digital Caviar Black is top dog in overall performance. Its 140+ MB/s read speed and 130+ MB/s write speed makes it about 25% faster than Green when transferring large files. Blue puts up a great fight here and is able to match Black's sequential transfer rates. When it comes to random read and write speeds, Black's blazing fast 6 ms access time leaves the rest far behind. This means Black is snappier when running programs (including the operating system) and offers superior multi-tasking. Reliability: Western Digital Caviar Black's generous five year warranty is the longest you'll find for a consumer-grade drive, and also hints at the manufacturer's confidence in its build quality. Most retailers, techies and heavy users (some with hundreds of hard drives) agree that Black is the most reliable among the different Caviar drives - A quick search on any popular tech forum will soon confirm this. Over the years, Black drives have even gained a loyal following of fanboys who would accept no other in their beloved computers. Power Consumption: In computing, high performance equals high power consumption and Black is no exception to the rule. Black pulls about 9.5 W during use, compared to 6.8 W for Blue and 4.5 W for Green. That said, the extra 3 to 5 W is pocket change when you consider that a high end or gaming computer gobbles up at least 300 W.
Price: It's no surprise that Black commands the highest price among the different WD Caviar drives. In terms of price per gigabyte, Black costs about 50% more than Blue and 35% more than Green - Click here for the latest WD Black prices. While there's no doubt that Western Digital Caviar Black costs the most, its generous five year warranty goes a long way to cut down replacement costs and improve its resale value. RECOMMENDATION: Offering both high performance and big storage, WD Black is ideal as a boot disk for running demanding large programs such as operating systems, games, graphics editors and databases. If you're a business user, Black's superior build quality also offers an added level of protection for your valuable data. Hard drives exist for two main reasons. One, to install and run programs. Two, to store and back up data - WD Caviar Green excels at reason two. Green isn't as fast as its Blue or Black sibling, but it is more quiet, runs cooler and consumes less power. Speed: Running at a fixed 5,400 RPM, Western Digital Caviar Green's read and write speeds are both in the 110+ MB/s range... making it slower than Blue and Black when transferring large files. Its access time of 17 ms is almost on par with Blue's 15 ms, but pales in comparison with Black's lightning fast 6 ms.
That said, WD Green is not slow by any means. In fact, it still outperforms most 7,200 RPM hard drives made in 2009 or earlier (back then they had average transfer rates of about 100+ MB/s). If you're using it to store and play media files such as images, videos or music, you will see little to no difference between Green and its faster siblings. Reliability: Backed by a two year warranty, WD Green has long enjoyed a reputation of being both dependable and long lasting. Green's low operating temperatures of 32 to 38°C plays a big part in reducing its failure rate over time. If you plow through customer reviews and forum feedback, you'll find most users agree that Green is even more reliable than Blue (though Black still ranks first). Power Consumption: True to its purpose, WD Green consumes the least power among all Caviar drives. During use it pulls just 4.5 W, compared to Blue's 6.8 W and Black's 9.5 W. At idle, its power usage falls even lower to a mere 3.3 W.
Price: Aimed at budget and mainstream consumers, WD Green is another affordable member of the Caviar family. Most of the time, it costs a tad more than Blue (~10% more) while being much cheaper than Black (~40% less) - Click here for the latest WD Green prices. 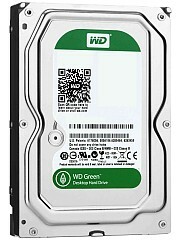 RECOMMENDATION: Western Digital Caviar Green is the best choice in two situations. One, as a mass storage or back up drive for storing documents, images, videos and audio files. Two, as the main hard drive of a home theater PC. For a HTPC, silent operation is far more important than breakneck performance for a HTPC... plus Green's low temps are better suited for HTPC cases which tend to be smaller and more cramped. SSD vs HDD - Should You Buy a SSD or HDD? What Affects Hard Disk Speed?